So so so excited it is Friday! This week was just overwhelming. I can’t wait to just put this week aside and have a fresh start next week. Lately, I’ve been planning absolutely nothing for the weekends. It’s been great. Self-care is so important yet it is easily forgotten. During this recovery from my cancer, I have learned that self-care is such a big factor in getting well and having a better long-term outcome. So if you all are just exhausted, tired, worn out, don’t be afraid to give yourself some ‘me time’. It’s been a while since I’ve been to this store. I used to shop here all the time during high school, and it was conveniently only a 5 minute drive from my parent’s house. It is my go-to to get high quality, name brands for a fraction of the cost. Can you guess what I am talking about? I am talking about T.J. Maxx. That store is just an addiction. I can’t walk out without buying at least one thing haha. So it’s been a few years since I walked into T.J. Maxx and a couple weeks ago my mom and I decided to take a quick trip there (haha quick! Yea right!). My eyes were beaming with excitement the moment I walked in and I didn’t know where to start! I decided to head to the dress section first. I mean it is summertime and all I want to wear is dresses. If you can’t tell already by all my outfit posts haha! I immediately saw this yellow paisley print dress! For $19.99, I quickly added it to my shopping cart! I love its color, paisley print, smocked style and maxi length. My T.J. Maxx trip was definitely a success and it opened up an old addiction. I forgot the nostalgia I get when getting an awesome item at an amazing price. Fun fact: A few years ago (back when I was also shopping at T.J. Maxx) I was voted a Maxxinista. It was one of the best news ever and it was from this post. Super super old photos! Anyway, I know the selection always changes at T.J. Maxx so if you are interested in a paisley print dress, below are my suggestions. By the way, the Nordstrom Anniversary Sale is not open to the public! Woohoo! Tomorrow I’ll be sharing a post on more Fall favorites. In the meantime check this section for all the post I’ve on the sale. This dress is so beautiful on you! You look stunning! TJ Maxx is like Target, you come to get one thing and leave with much much more! I love how it feels like a treasure hunt sometimes to find the best stuff! I haven't been in TJMaxx in a while either, but I love it. That dress is so cute. Been juts loving all your photos lately. Self-care is so important. I'm glad to hear you are taking care of yourself. Lovely dress! These pictures are very nice, keep up! SUCH a steal for that dress! It looks great on you and you can't beat that price! This maxi is adorable! These colors look so great with your brown hair! 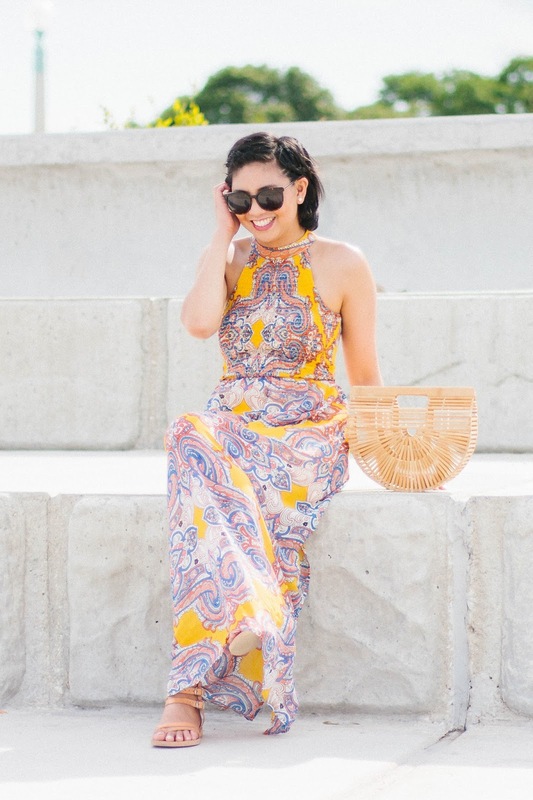 The straw bag goes so well with with sun dresses! This dress is so cute! Love the color. You look great babe! Your background looks incredible, I love the colour of your dress, it's stunning! I haven't been to TJ Maxx in ages but I need to head there. And "me time" is so important. 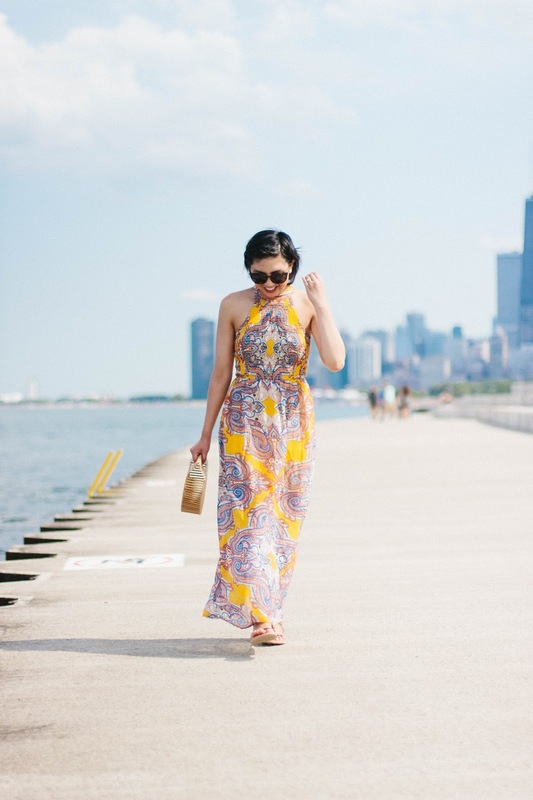 I love your maxi dress and how you styled it with the pretty wooden bag. The photos by the beach are gorgeous! Thank you so much Ada!! Definitely worth checking out! I've been an avid TJMaxx shopper since high school as well, though my visits never diminished in frequency. It was even a purchase made there which prompted me to start my blog! Love the dress you found, it's stunning and I love the attainable TJMaxx price point. No way! Tj Maxx really is the best! I'm obsessed with this dress and how you styled it! Obsessed with that straw hand bag! So fun! Absolutely stunning in this dress! I am such a sucker for TJMaxx/home goods they have the greats deals! Me too! I can spend hours there haha! This is stunning Rach! And thank you for the reminder about TJ Maxx! Hope you have a restful weekend! Thank you so much Heidi! Yes, totally worth checking it out again! Your looks are always pretty. This is again something really cool and nice for summers. This dress is so good! I love this! Looking SO gorgeous lady! Love this combo. And the background looks so pretty. This is so pretty. I love this dress the color of it is so unique. What a fun summer outfit- and I LOVE that bag! Looking too cute in this yellow dress so cute. You look radiant Rach, so you must be doing the self-care thing right! This dress looks amazing on you and I love how simple the outfit is yet so stylish and summery. 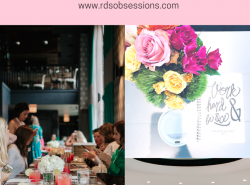 Beautiful pics and beautiful you! Hope you are having a nice stress-free weekend! Thank you Saida! Self-care is still a work in progress but Ii am doing my best to make it a priority! Thank you and have a wonderful weekend! Love that bag so much but I dont have the money to spend on it right now any sugestions of less expensive bags that are similar? Yes, I do! There are dupes very similar that are half the cost. Email me, and I can send you links! I agree with you – that is a beautiful paisley print! What a steal for its price! TJ Maxx always has so many hidden treasures! Girl, TJ Maxx is a go-to for me!! I find lots of unique finds there! TJ Maxx is great! Loving this look girl <3 So summer! This dress & these colors are stunning on you!